Southern African Wildlife College CEO and Vice Chancellor, Theresa Sowry, University of Mpumalanga Vice Chancellor, Prof Thoko Mayekiso and Dean Faculty of Agriculture and Nature Conservation, Prof Moses Mbewe. The MoU allows students from the UMP to be immersed in understanding and solving real conservation issues thanks to the physical positioning of the SAWC campus in a wildlife area, with neighbouring communities, and its commitment to applied learning. From SAWC’s perspective it will increase the College’s capacity to carry out research to improve conservation practices. “We have many mutual objectives when it comes to building the skills, knowledge and capacity of the conservation leaders of the future. 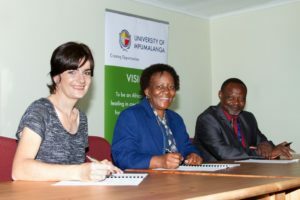 Working together, we believe that our respective students will benefit from our complementary approaches to higher education in the conservation sector and the opportunities these afford students,” noted Vice Chancellor of the UMP, Professor Thoko Mayekiso and CEO and Vice Chancellor of SAWC, Theresa Sowry in a joint statement. holistic development of students through teaching and learning, research and scholarship, and engagement, in collaboration with strategic partners. SAWC’s hands-on training programmes have a 20 year track-record of producing highly competent and motivated conservation practitioners who ‘learn-by- doing’. “In signing this MoU, it is the aim of both the SAWC and the UMP to apply our respective skills and resources to improve the many aspects of conservation training on offer in southern Africa. Working together will positively impact the roll-out of our teaching, learning and research objectives, to the end benefit of conservation,” noted Mayekiso and Sowry. The institutions’ collaboration may extend to jointly developing funding proposals, or seeking funding, for both on-going or new projects that have potential for collaboration. It will also allow for better benchmarking of each institutions’ programmes for best practice purposes. This will include examining opportunities for qualification articulation, recognition of prior learning and credit and accumulation, as well as transfer schemes for the institutions’ qualifications. Closer alignment on qualifications will also mean that SAWC Advanced Certificate students can seamlessly transition to the university’s second year of their Diploma in Nature Conservation (DIPCON) qualification. It will also open up post-graduate studies opportunities with the SAWC campus in the Greater Kruger area as a practical, applied learning site for the UMP. Southern African Wildlife College staff with representatives from the University of Mpumalanga. 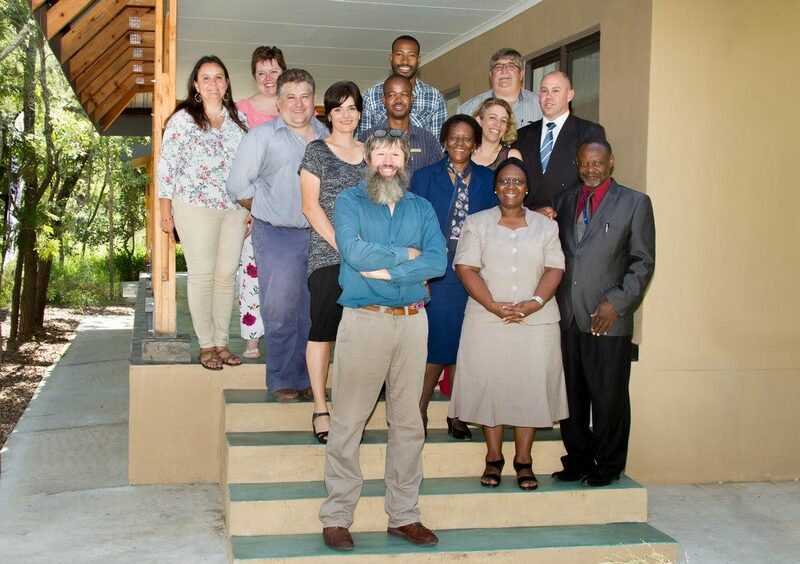 Back row, left to right: Dr Yolanda Pretorius , Anelle Rautenbach, Sboniso Phakati, Gerhard Viljoen (UMP), Ashwell Glasson, Chris Kafoteka, Dr Cleo Graf, Prof Dan Parker (UMP) Theresa Sowry, Prof Thoko Mayekiso (UMP), Prof Alan Gardiner, Prof Phindile Lukhele Olorunju (UMP), Prof Moses Mbewe (UMP).